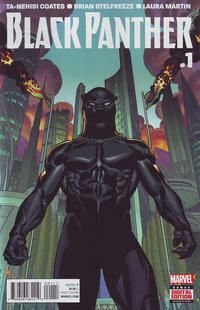 There have been many Black Panther series over the years from Marvel, but the title has never been one to appear near the top of the sales charts. In April, the new series from Ta-Nahisi Coates and Brian Stelfreeze not only was the comic book most ordered by comics shops in North America, but with sales of more than 253,000 copies, Black Panther #1 is easily the best-selling issue of the year thus far. Click to see the sales estimates for comics ordered in April 2016. As we mentioned here on Friday, the overall sales reported by Diamond Comic Distributors reflect a considerable drop, not all of which can be attributed to the fact that last April was the highest volume month of the year — and had one more week to boot. One of the elements playing a role, as noted there, is the fact that the pace of new comic book releases has slowed in 2016. That's a much larger drop, of more than 12%. The number of new releases from Diamond from non-Top 7 publishers is up 29% — but since those publishers titles sell far less on average, they don't come close to making up the difference. While Marvel actually published about an additional comic book a week, Dynamite cut its new comics offerings nearly in half, and Boom reduced its release pace by more than a third. Every other publisher in the top seven also cut back, but by smaller numbers. Remember, this is an exactly equivalent time period: seventeen weeks. We see in looking at graphic novels, however, that several of those publishers have in fact redirected attention towards graphic novels this year. That's right: the number of new graphic novel releases is up 15% overall year-to-date, and Boom has increased its number of releases by 69%. [Update: I was aware that the Boom shift had been announced sometime late last year — and have finally located the link. Clearly that plan has gone forward.] DC, Marvel, and the collected publishers under seventh place are up double digits. And that would seem to track with the story of the year, so far: comic book dollars are down nearly 8%, while graphic novel dollars are up close to 5%. The problem is simply that since retailers spend two of every three dollars on comic books, a slowdown in that category erases a percentage increase of twice the size on the graphic novel side. And since it was the larger publishers that were releasing more comics last year, the absence of those issues has an outsized effect. So supply appears to be a factor; regression analysis might find out how much (a project for another day). It should be noted that smaller release slates aren't necessarily a bad thing, if the result is that the publishers and retailers are earning more profit per title; figuring out how much the comics market will absorb is the name of the game. It does appear that in 2016, at least thus far, the six publishers after Marvel in the charts have been a little more (and in some cases, a lot more) conservative in their periodical releases. This month's 300th place title sold 4,309 copies, which is the highest figure seen so far this year in that slot; that seems to suggest that the volumes on that smaller number of titles are hanging in there, at least this month. Click to see the sales of 300th-place titles across time. As noted, the average comic book in the Top 300 cost $3.93; the average comic book retailers ordered cost $4.12. The median and most common price for comics offered was $3.99. Click to see comics prices across time. John Jackson Miller has tracked the comics industry for more than 20 years, including a decade editing the industry's retail trade magazine; he is the author of several guides to comics, as well as more than a hundred comic books for various franchises. He is the author of several novels including Star Wars: Kenobi, Overdraft: The Orion Offensive, and Star Wars: A New Dawn, now available in paperback. 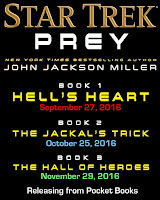 His trilogy for 2016, Star Trek: Prey, ships in consecutive months in September, October, and November. Visit his fiction site at http://www.farawaypress.com. And be sure to follow Comichron on Twitter and Facebook.